Let our fresh blend of zesty botanicals and refreshing vitamins take you to the peak of all of the benefits contained within! Our Water Therapy Elixirs will bring a relaxing end to a long day, or a soothing experience to any indulgence. Nothing beats our fragrant blend of natural extracts fused with our own special mixture of vitamins and minerals. 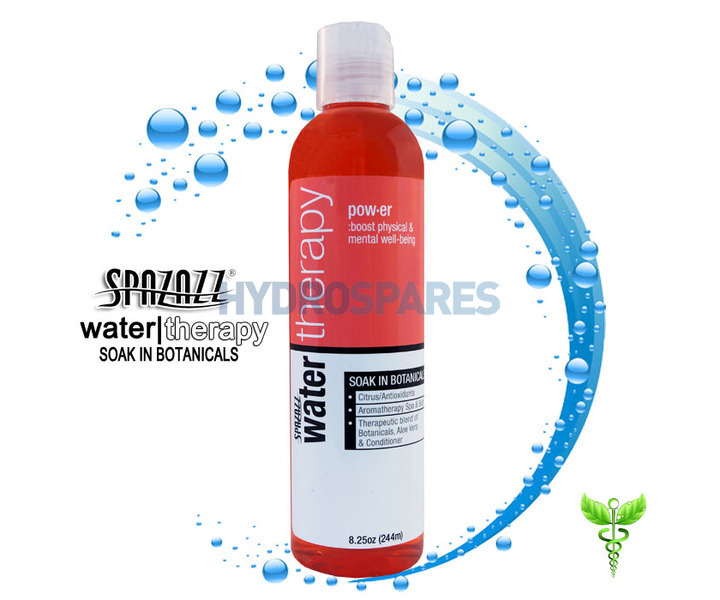 Relax and enjoy while you allow our Spazazz Water Therapy Elixir to do the rest! Boost your physical and mental well-being. Take in the fruity freshness of citrus. Power Water Therapy is loaded with antioxidants. You'll feel renewed with a boost in energy, all while feeling moisturized by the aloe vera. Rehydrate your skin with a little Power Water Therapy in your water. The clean, fresh smell of citrus will re-energize and lift your spirits. Pour 1-2 capfuls of water therapy elixir to your .. spa, bath, shower, steamer, sauna & humidifier to attain your desired aroma level.